Canadian Prime Minister Justin Trudeau says "an entire country is in shock and mourning" in the wake of a deadly bus crash in the province of Saskatchewan. There was an outpouring of grief across Canada at news of the collision between a bus carrying a junior ice hockey team and a semi-trailer. 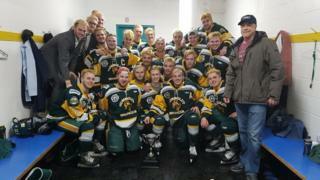 The Humboldt Broncos team, which has members aged between 16 and 21, were en route on Friday to a play-off game. At least 15 people have been confirmed dead in the crash. Details have been slow to trickle out in the wake of the tragedy, and the identities of the deceased have not yet been released by authorities. Tom Straschnitzki said his son Ryan is in hospital in Saskatoon with a serious back injury, and told his father that he can't feel his legs. The family flew to his bedside on Saturday to be with him. "He keeps asking about his team and coaches. I say: I don't know son," he told the BBC from his home in Airdrie, Alberta. Mr Trudeau said in a statement that "our national hockey family is a close one, with roots in almost every town - small and big - across Canada". He has received calls of condolences from other world leaders, including US President Donald Trump. Rob Muench, mayor of the 6,000-population city of Humboldt where the team are based, said it will take years for the community to come to grips with the tragedy. "Throughout Canada we see teams going out into the Canadian winters on buses all the time and it's always a thought in parents' and fans' minds about what could happen," he said. "There is no playbook on what to do in cases like this." The Humboldt Broncos, who play in the Saskatchewan Junior Hockey League, were travelling to a game against the Nipawin Hawks. Nipawin Apostolic Church lead pastor Jordan Gadsby told the BBC he opened his church to families shortly after learning of the crash. "The worst part of the night was sitting with and watching parents cry as they waited to find out if their son was alive or not," he said. "It's an awful tragedy. I wish we could re-do yesterday. But we can't. We have tomorrow instead." What is known about the crash? The lorry and bus collided on Friday at around 17:00 local time (23:00 GMT) on Highway 35, north of Tisdale. The Royal Canadian Mounted Police said 29 people including the driver were on the bus at the time, and that15 people were killed. The other 15 passengers have been taken to hospital. Two remain in critical condition. The lorry driver was not injured in the collision. Police said on Saturday they have yet to determine the cause of the crash. Myles Shumlanski, father of one of the Broncos players, described the scene as a "disaster" to the Saskatoon Star Phoenix paper. "We had a crane lifting the bus," he said. It is not yet known who has died. There were ice hockey coaches on the bus in addition to team members. Photographs on social media showed several of the players comforting each other in hospital. News of the crash has shocked Canada, where ice hockey is a national sport and loved by many. Humboldt Broncos President Kevin Garinger extended his deepest sympathies to the injured, the deceased, and their loved ones. "We are heartbroken and completely devastated by the tragedy that occurred yesterday." Hockey fans, players and teams also expressed their condolences. The young athletes who play in the Saskatchewan league and similar organisations often go on to play for colleges or for major junior teams across North America. Some are picked up by the National Hockey League. One GoFundMe page, set up to support the families and players, raised over C$1.3m ($1m; £735,000) in just 18 hours. Another GoFundMe fundraiser raised over C$100,000 in 11 hours. Canada has experienced similar tragedies before. In 1986, on a frigid and blustery late December day, a bus carrying the Swift Current Broncos junior hockey team hit a patch of black ice on a Saskatchewan stretch of the Trans-Canada Highway, killing four players. Since 1987, Western Hockey League team uniforms have been adorned with a clover patch in remembrance of the young men killed that day. A roadside monument was erected at the crash site 30 years later. Did you witness the crash? Share your experiences by emailing haveyoursay@bbc.co.uk. If you are happy to be contacted by a BBC journalist please leave a telephone number that we can contact you on. In some cases a selection of your comments will be published, displaying your name as you provide it and location, unless you state otherwise. Your contact details will never be published. When sending us pictures, video or eyewitness accounts at no time should you endanger yourself or others, take any unnecessary risks or infringe any laws. Please ensure you have read the terms and conditions.